One of the things we hope to share on here are those practical tips people use in day to day practice. There was an obvious spot to start. This is a post about frustration. It’s a post about humility. It’s a post about annoyance and triumph that shouldn’t be treated as a victory. Getting a cannula in the patient can be the most mundane, most satisfying or most frustrating part of a day at work for a kids’ anaesthetist. Cannulation is not just useful clinically. It has an excellent habit of keeping any practitioner from getting too far ahead of themselves, just when they are feeling like the supreme clinician. Anyone who has worked with anyone else has also seen or heard lots of different tips and tricks that individuals have built into their practice over the years. Of course, if there was a single thing that worked in every single patient, we’d all do it that way. We thought we’d collect tips from a range of clever people to start building up a list of things that people make a point of doing when cannulation is a little difficult. Sometimes they’re really simple things. Sometimes they’re very particular. Most of them are probably in the setting of the child who has undergone inhalational induction (those kids can still be hard of course). Hopefully people will feel moved to add their own flashes of brilliance in the comments. Here it is – a compendium of cannulation classics from Drs Justin Skowno, Su May Koh, Hillel Hope, Ramanie Jayaweera and Ian Miles. Oh, and me (Andrew Weatherall). “Sometimes when I’ve missed out, I go to look at another limb and realise there was a way better choice there. Maybe I went to the first spot because it was closer, or because it would be in a slightly better location once the patient was positioned. Those factors aren’t nearly as convenient as a cannula that’s in. So I try and remember to have a quick look everywhere.” (AW). “If it looks like it might be difficult, spend as long you need to in identifying the best vein before actually starting your first attempt.” (IM). After (missed the pretty ribbon bit). 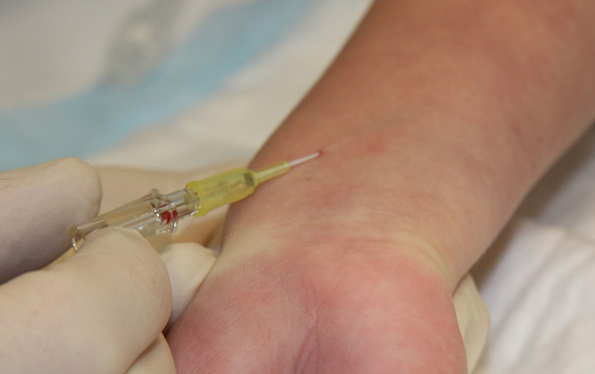 “If cannulation looks difficult, get the ultrasound early. It increases your options – forearms, cubital fossa and above; and of course the long saphenous vein.” (SMK). Should we stop at nine? We can’t pretend this is an exhaustive list (though you can see a few come up again and again). Cannulation is a good example of a technical skill where there is more than one way to get it done. We could probably have listed “don’t be shy about getting someone else” too because sometimes it just needs a set of fresh eyes. Anyway, maybe there’s more than nine. We sure hope so because that could be what the comments are for. Over to you. Bring us your huddled masses of cannulation tips and tricks. We could all do with being better. Note: The image of cannulation in the post came with consent from the family involved. 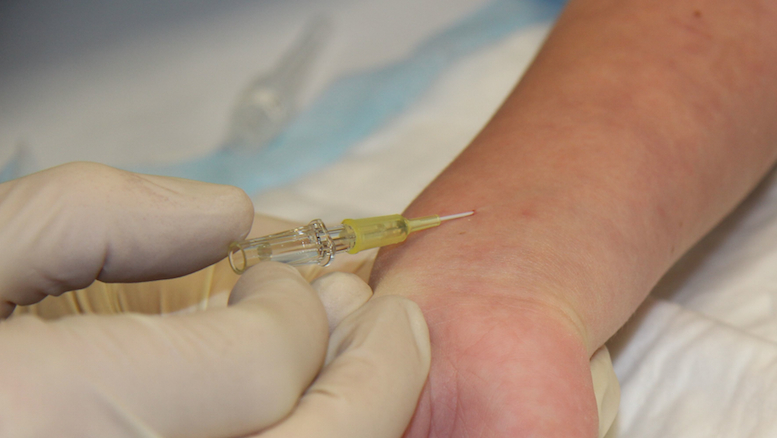 Tap the skin repeatedly over the vein and it will dilate. Don’t shine a bright OR light on the skin. Better tilt the hand 90 degrees to the ambient light. You will see shadows that will show where the vein raises the skin. Use a esmarch tourniquet starring at the axillary and wrap dis tally toward the hand. This will dilate the vein with all the blood of the upper arm. Thanks. Particularly good to note the problems with direct light. So many people want to help with the blinding direct light. awesome tips! I like that saline trick, Andy. thankyou for making horrible clinicians, decent! 2) We’re just providing thoughts – it’s the clinicians who will take anything useful away and do the hard work of getting more excellent. Just reposted on ITLS British Columbia! Great tips! Thanks. We’re really glad to hear it hit the spot. Point 3 is something I agree with especially. One point I’d add is the value of the pause between advances. With the small 22 & 24 g safety cannulae it takes a moment for the blood to track up the cannula and indicate correct placement. The pause is gold! Beautiful. We can intubate, we can place pulmonary artery catheters, dialyse via a vascular catheter but the art of placing a cannula is where it all begins. Thank you for so eloquently describing this most essential skill. And well put in return. We were trying to collect some tips that might give that extra 1% for the tough ones. Thanks so much for reading. Brilliant tricks – thank you. Thanks so much and thanks for adding your own excellent one (clearly particularly important when not using the sevoflurane advantage). Thank you very much. Excellent post and I have used many of the tips successfully! Thanks so much and that is very exciting to hear. As for your idea, hadn’t thought of that as a topic. Might do another vox pop. Ps if you get a time and you happen to be looking for more post ideas a similar thread on top tips for successful LPs would be very much appreciated. Thanks again!